American architect Frank Lloyd Wright (1867-1959) designed more than 500 completed projects: Homes, schools, skyscrapers, churches, offices, museums. And one synagogue. When Beth Shalom Congregation moved from downtown Philadelphia to the suburbs, the synagogue board wanted to make a bold statement with their architecture–and so they hired Wright to redesign their building. Construction began in 1953 and was completed in 1959. 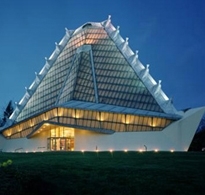 Wright designed the building to look like a “luminous Mount Sinai,” with an extravagant fountain at its entrance, carpet that’s meant to look like desert sands, and a mountain-like roof that looks a bit like a Klingon spacecraft. The building, which is in Elkins Park, PA, has been accorded status as a National Historic Landmark. Wright’s design surrounds congregants with meaningful symbols, adding a new spiritual dimension to the very act of going to synagogue.